The Drop D tuning is common in hard rock styles and one is that it allow power chords to be played by placing a single finger over the same fret. Drop D tuning should not be confused with Open D tuning.. 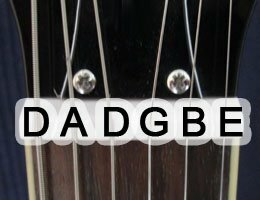 Here is how you tune the guitar: DADGBE. Compared to standard tuning, the only difference is that you tune down the lowest (thickest) string a whole step, from E to D. When you have a guitar that delivers some more bass in the sound; perfect for some rock styles as already mention, but there are other possibilities as well. There is also the Double Drop D.
There are two alternatives for playing power chords in this tuning. Here are examples of chords with both shapes, which obviously are movable. The popularity of this tuning depends much on the many cool riffs that can be easily created by using chords with the same bass note. A video that demonstrates this. Power chords with alternative bass notes are also very useful and can be used together with the regular power chords presented above. Since only the lowest string differs from standard tuning, many open chords could be played just as normal. Although, for chords using the sixth string, such as E and G, there are some new conditions. The conditions for barre chords changes when the lowest string is included. This was an introduction about chords and playing ideas in Drop D tuning, see also Drop C tuning.